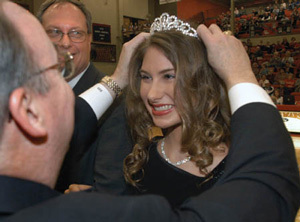 Reflecting upon her experiences that led to being crowned Homecoming Queen, Laura Lee Moore wrote a personal story that portrays the love for education first instilled by her parents and how it prepared her to thrive in university life. The silver tiara sparkled in the gym’s overhead lights and its twinkle transported me from a basketball court decorated for a college homecoming to a medieval court awaiting a coronation. As the loudspeaker burst forth with a warbled version of my name and major, I stepped forward to allow our university president to crown me Miss Union University. As I felt the crown’s weight pressing against the back of my scalp and listened to my introduction, I felt far away as if I were eavesdropping on someone else’s story. All the memories that brought me to this moment flashed through my mind. As I grasped my father’s arm and proceeded across the gymnasium, I felt it appropriate to celebrate this significant milestone of my senior year with the man who has been both my father and teacher for 22 years. I thought back to the time he grasped my hand across the dining room table as our family learned Spanish together, or the way he taught me to sing the Greek alphabet with his booming bass blending perfectly with my 9-year-old soprano. I looked up into his face and saw the same quiet pride I had seen in high school as I stole and devoured theology books from his desk and talked with him about politics and government. Looking across the crowd, I spotted Dr. David Gushee, my ethics professor, and thought of the endless after-class discussions about worldview and the Christian’s role in social ethics. I saw my mom in the crowd wiping tears from her eyes and thought of all the times we had laughed and cried together as she read to me for hours and helped develop my love for reading and learning. I noticed Heather – a freshman – sitting toward the top of the bleachers. Last semester I helped her study for Old Testament and introduced her to mnemonic devices. I will never forget the song we made up about the twelve tribes of Israel! Closer to the end of my formal education than to the beginning, I can confidently say my doubts are quieted and my burning questions answered. Not only was I prepared to survive as a homeschooler in college, I was prepared to thrive. Sure, I have to spend more time picking out clothes, taking notes and carrying backpacks than I did in high school, but the key principles of learning were already instilled in my character. I find my experience in home education has enhanced rather than hindered my capacity to learn, the depth of my experience and the quality of my relationships. Tête à têtes with my dad prepared me well to engage in healthy debate with adults and students alike. As I helped new freshman transition to college life or sipped coffee and discussed key issues with my professors, I realized what an asset it is to grow up interacting with a variety of age groups rather than becoming accustomed to socializing with one set peer group. As a homeschooler, I interacted with adults at a high level, taught my younger brothers and spent significant time with people of all ages in our community. While I observe some students isolating themselves from professors they see as the enemy, I naturally expect my professors to be mentors and friends who want me to learn. Growing in the discipline of independent study was an absolute necessity in a house with four children all learning at different grade levels. My mom encouraged a natural curiosity, a love for reading and self-motivation. Each semester we developed goals and identified subjects we wanted to learn about. As I tackled projects related to my goals, I discovered my education is primarily my responsibility – a truth that has carried me through many semesters of challenging classes. Professors respect a student who is actually motivated to learn. College students cannot survive by merely depending on a traditional classroom setting to gain all their information. Reading outside of class, independent research and asking good questions of the right people are survival skills for the student who wants to excel. The sound of my dad slowly turning the weathered pages of his Bible, our family discussion of Revelation in the van on the way to a field trip and the precious hours our family spent in prayer together are a part of the memories of my school days. Learning the tenants of Islam by witnessing to Arab friends in our local gas station and discussing the value of sanctity of life in a Postmodern culture helped me think critically, know what I believe, and integrate my Christian worldview into all aspects of my life – including education. As my primary teachers and mentors, my parents had the greatest shaping role in my values. No one has had a more significant impact on my character. Because of their investment in my personal walk with Christ as well as sound biblical teaching, I am grounded in my faith as well as academics. I learned from my parents early on that faith and learning are inextricably tied. Growing under my parents’ instruction as well as learning independently has allowed me to walk away from my college experience with a new level of articulation in my beliefs, a treasure of quality relationships and a reinforced foundation in addition to my degree. As I hugged my dad on Homecoming Day and looked out across the crowd of fellow servants, friends and teachers, I realized I could victoriously affirm my home education as a preparation in more than facts and figures. At the climax of my college experience, I celebrate my unique education as a lesson in living life to the fullest. Click here for more information about Union University.